Gazania is a genus of low-growing, trailing ground covers with daisy-like blooms that open on summer and fall days, closing at night. It only grows 0.5 to 1 foot (15 to 30 cm) tall and 1 to 2 feet (30 to 60 cm) wide, but its vivid flowers more than make up for its lack of height. Although grown as an annual in much of the country, this plant overwinters in U.S. Department of Agriculture plant hardiness zones 8b through 11. Plant this colorful, low-growing specimen outside in containers or directly into the ground to incorporate it into your landscape. Pinch off fading flowers with your fingers to encourage a longer bloom period. Prune annually in late winter or early spring, beginning in the second season, cutting the foliage back to 2 or 3 inches above the ground with pruning shears. This will refresh the plant and encourage new growth. Fertilize annually soon after pruning, beginning in the second season, with a teaspoon or two of 10-10-10 granular fertilizer, scattering it evenly around the edges of the plant and watering it into the ground. Gazanias can tolerate soils with low fertility, and actually do not do well with excess fertilizer. In even moderately fertile soil they do not require this application, but it can encourage healthy early season growth. 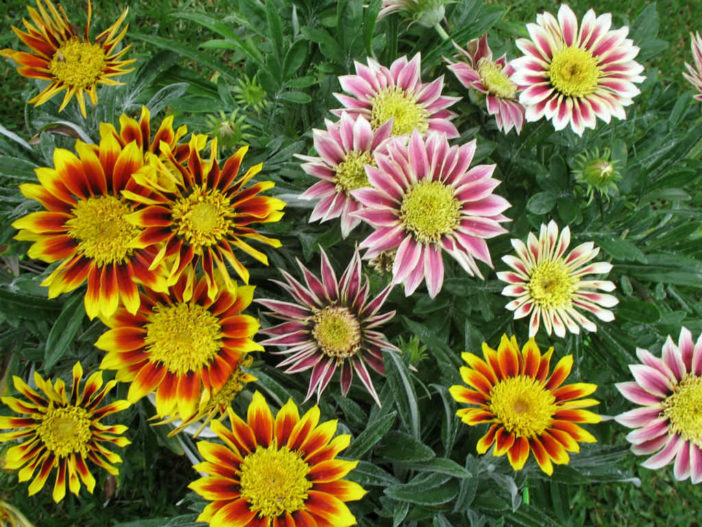 Plant different varieties of Gazanias in a bunch for a colorful mix. Gazanias are particularly suited for creating a fast-spreading garden spread. They self-seed and grow very quickly. However, you can fasten the propagation process. For this, systematic division of young Gazanias is needed. Choose Gazanias that are about 10 inches (25 cm) tall. Using gardening scissors, cut through the basal stem, dividing it into two halves. Each half will now grow as an individual plant.